This is part 3 of a series of poems about bodies of water. Each poem is written in the form of a popular poetic style native to that body of water. In Water Poetry 1, I wrote a haiku about the Tama River in Japan and how it resembled the stream of people in a busy train station. In Water Poetry 2, I wrote a sonnet about London’s Thames River, putting the river’s long history into perspective against the London bombings and corporate greed. Water Poetry 4 riffs on the San Francisco Bay. Water Poetry 5 is a sijo about the Han River. 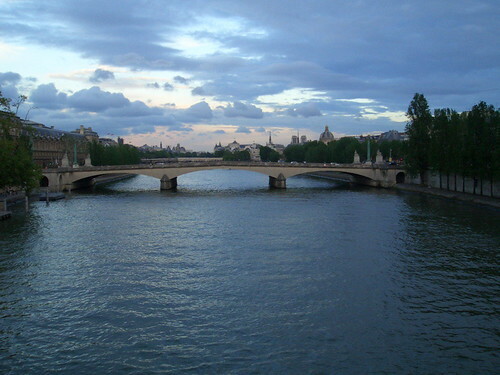 This post is about Paris’s Seine River, written in a villanelle. Although it’s known as a French poetic form, there are probably more villanelles written in English. I like it because of the refrains that are repeated throughout the poem. I think the repetition reintroduced amidst different lines gives more and more depth to the introductory lines. So if you want to write one, just follow these guidelines. There are 19 lines of poetry in a villanelle. They are separated into 5 tercets, each composed of 3 lines, and a final quatrain, composed of 4 lines. The first tercet is very important as the 1st and 3rd lines are repeated in the following tercets, while the 2nd line is rhymed throughout. The rhyme scheme is as follows: A1bA2/abA1/abA2/abA1/abA2/abA1A2. As you can see you’ve got to find a lot of words that rhyme with two words. I wrote this poem when I visited Paris for the first time. I was only there for a few days so I powered through, walking everywhere. I tried to avoid the metro, their subway, because I wanted to stay above ground and see the streets and daily life between the main sights. I only relented at the end of the 3rd day because my feet were killing me. What I observed was a very multicultural city full of African and Southeast Asian immigrants. And as I experienced in my previous trips to France, people were open, conversational, friendly. There was a sense of lightness, that the past is the past and the present and future could be grudge-free. Of course, the riots in the past couple years paint a much more complex picture. The idyllic Paris is surrounded by the less charming, much poorer suburbs. Whereas in the US, the rich live in the suburbs and work in the city, in Paris, the rich live in the city and the people who work for them commute in from the suburbs. I think Manhatten has become like this, and San Francisco is approaching this model. Nevertheless, the grumpy cloud that had weighed me down in England abated a little and I felt like I was Amelie, seeing whimsy and magic everywhere, although I’m much less cuter. What of the refugees, Gypsies, the Hmong? Who will protect the weak against the strong? I likewise will let go of feeling wronged. I’ll say it again–I love it. This is a great compliment coming from my friend Mendy, a fabulous writer and creative force. I’ve put a link to this on my blog as an example of a contemporary villanelle. thanks kanani, you’re the first person to link me to their blog. so cool. I can easily see you writing prose poetry–you have such a light, free spirited voice. This villanelle is very interesting–almost a mix of the romantic and the modern revolutionary. cheers lynn. i also enjoyed your blog. i like how you detail your life through pure poetry. maybe i should switch over to an all poem blog myself. Previous Previous post: Holy Koi!